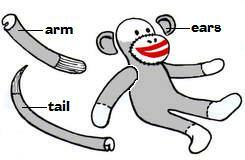 How to make a classic sock monkey toy with the modern sock monkey pattern and easy to follow directions. 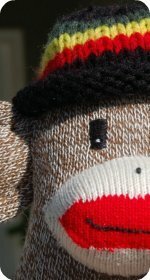 A fun monkey project to craft a pair of red heel socks (or any other socks) into a stuffed sock monkey doll. 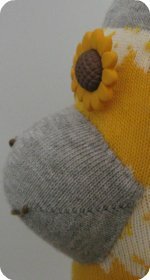 Also available a free sock elephant pattern and ideas for other sock animals. 1. One Pair Original Rockford Red Heel socks. Sew a seam on both sides of the center of one sock starting three inches from the white heel, curving across the end of the top. Cut sock between seams and to within 1 1/2 inches of white heel. This leaves an opening in the crotch. Then turn sock so seams are inside and use crotch opening to stuff head, body and legs. Hand stitch to close gap. Cut the upper part of the second sock into 2 pieces. Seam, rounding ends and stuff the arms. Attach to the body by hand. Cut the heel from the sock, leaving a brown edge around the white. Fasten on lower part of the face by hand-stitching around the bottom; stuff and finish sewing around the top. The mouth can be enhanced by embroidering a running stitch in either black or white across the middle of the lips. Cut a one inch strip on front of sock, tapering to end of toe. Seam, stuff and attach to body by hand. 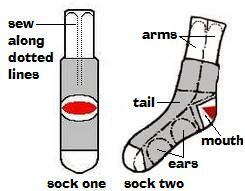 Cut the ears from remaining brown part on the sole of the sock. Attach to head by hand. 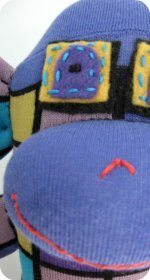 Sew on moving eyes, buttons, felt or embroider eyes with black thread. (For very small children embroider eyes). Cut off toe of another sock sock, leaving 1/2 inch of brown to roll for a brim. Sometimes a fez is used for a cap. There are many variations from this basic pattern. Decorations such as pompoms, yarn, bells can be added. Jackets, vests, pants, skirts and shoes are also used for clothing. The modern plans vary to the vintage patterns that are available. The modern pattern creates a monkey with a shorter tail and wider arms compared to the vintage pattern. A cap which is optional, would have to be cut from a third sock if you are using the modern pattern, whereas the vintage pattern allows a cap to be cut from the second sock. 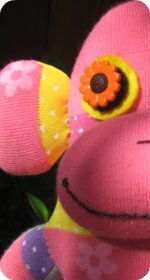 If you are wanting a hat for your monkey or whatever sock creature you have, we've got a fun variety of original knitted hat patterns you can choose from. 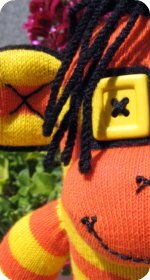 If you are looking for a little inspiration on different styles of funky socks that have been made into monkeys head to our sock monkey gallery page. 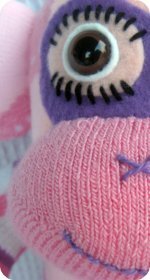 The sock animal patterns are great for a beginner as the instructions are easy to follow. 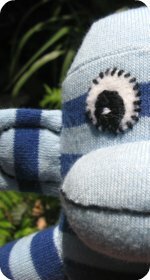 The sock dolls can be sewn together with a sewing machine or by hand.